On Earth, acrylonitrile, also known as vinyl cyanide, is useful in the manufacture of plastics. Under the harsh conditions of Saturn's largest moon, this chemical is thought to be capable of forming stable, flexible structures similar to cell membranes. 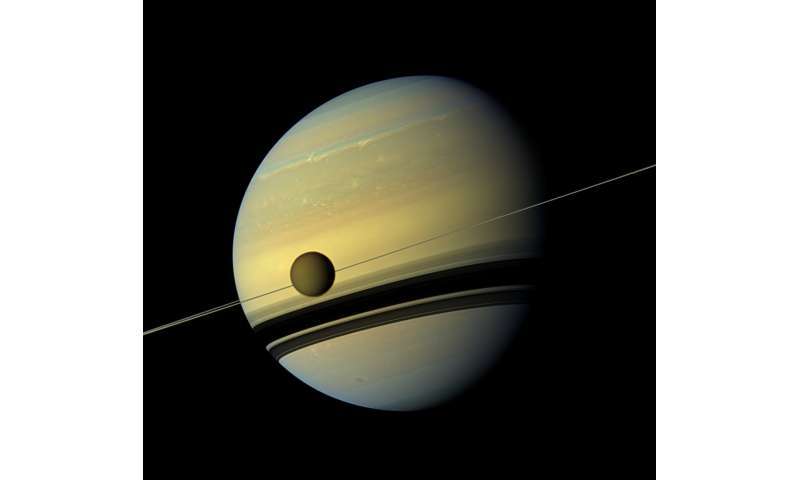 Other researchers have previously suggested that acrylonitrile is an ingredient of Titan's atmosphere, but they did not report an unambiguous detection of the chemical in the smorgasbord of organic, or carbon-rich, molecules found there. "We found convincing evidence that acrylonitrile is present in Titan's atmosphere, and we think a significant supply of this raw material reaches the surface," said Maureen Palmer, a researcher with the Goddard Center for Astrobiology at NASA's Goddard Space Flight Center in Greenbelt, Maryland, and lead author of a July 28, 2017, paper in Science Advances. The cells of Earth's plants and animals would not hold up well on Titan, where surface temperatures average minus 290 degrees Fahrenheit (minus 179 degrees Celsius), and lakes brim with liquid methane. Those researchers proposed that acrylonitrile molecules could come together as a sheet of material similar to a cell membrane. The sheet could form a hollow, microscopic sphere that they dubbed an "azotosome." This sphere could serve as a tiny storage and transport container, much like the spheres that lipid bilayers can form. "The ability to form a stable membrane to separate the internal environment from the external one is important because it provides a means to contain chemicals long enough to allow them to interact," said Michael Mumma, director of the Goddard Center for Astrobiology, which is funded by the NASA Astrobiology Institute. "If membrane-like structures could be formed by vinyl cyanide, it would be an important step on the pathway to life on Saturn's moon Titan." The Goddard team determined that acrylonitrile is plentiful in Titan's atmosphere, present at concentrations up to 2.8 parts per billion. The chemical is probably most abundant in the stratosphere, at altitudes of at least 125 miles (200 kilometers). Eventually, acrylonitrile makes its way to the cold lower atmosphere, where it condenses and rains out onto the surface. The researchers calculated how much material could be deposited in Ligeia Mare, Titan's second-largest lake, which occupies roughly the same surface area as Earth's Lake Huron and Lake Michigan together. Over the lifetime of Titan, the team estimated, Ligeia Mare could have accumulated enough acrylonitrile to form about 10 million azotosomes in every milliliter, or quarter-teaspoon, of liquid. That's compared to roughly a million bacteria per milliliter of coastal ocean water on Earth. The key to detecting Titan's acrylonitrile was to combine 11 high-resolution data sets from ALMA. The team retrieved them from an archive of observations originally intended to calibrate the amount of light being received by the telescope array. In the combined data set, Palmer and her colleagues identified three spectral lines that match the acrylonitrile fingerprint. This finding comes a decade after other researchers inferred the presence of acrylonitrile from observations made by the mass spectrometer on NASA's Cassini spacecraft. 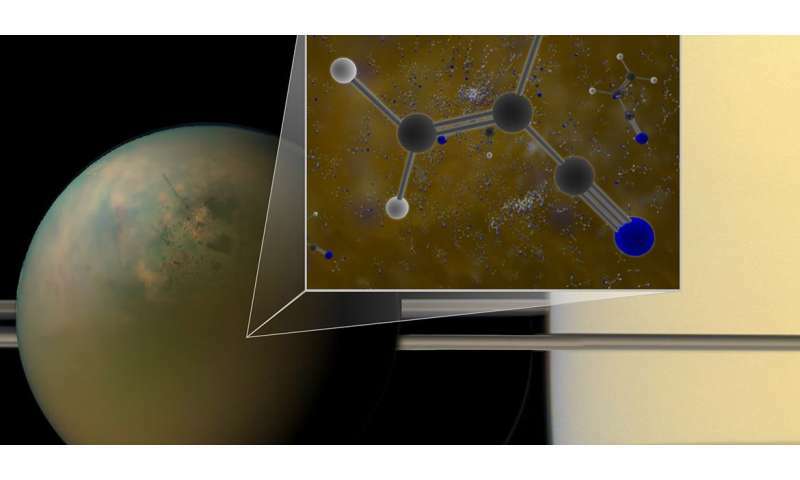 "The detection of this elusive, astrobiologically relevant chemical is exciting for scientists who are eager to determine if life could develop on icy worlds such as Titan," said Goddard scientist Martin Cordiner, senior author on the paper. "This finding adds an important piece to our understanding of the chemical complexity of the solar system."